"The cameraman just ran into J.T. 's leg!" Although Ohio State survived at Michigan on Saturday to remain alive in the College Football Playoff hunt, it did so without starting quarterback J.T. Barrett. 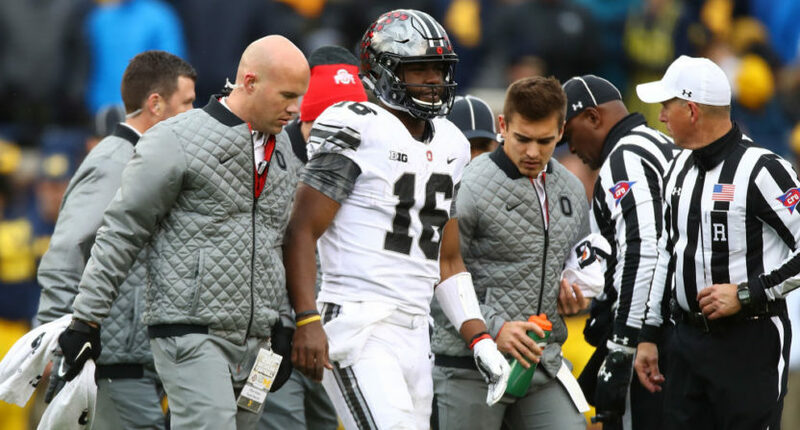 Barrett was abruptly announced out with a knee injury, and after in postgame press conferences he and coach Urban Meyer revealed the injury actually occurred when a cameraman collided with Barrett before the Buckeyes’ offense took the field and twisted the quarterback’s knee. Barrett supposedly wasn’t the only player who had issues with folks on the sideline during Saturday’s game. Running back Mike Weber claimed he got dinged up by a cameraman as well. Apparently Mike Weber was also dinged up by a camera guy on Saturday in Ann Arbor. Was told this happened during the game. Fortunately, Barrett’s injury does not appear to be too serious. He’s probable for the Big Ten Championship Game against Wisconsin next week.